【1】Solano, R., Stepanova, A., Chao, Q., & Ecker, J. R. (1998). Nuclear events in ethylene signaling: a transcriptional cascade mediated by ETHYLENE-INSENSITIVE3 and ETHYLENE-RESPONSE-FACTOR1. Genes & development, 12(23), 3703-3714. 【2】Boutrot, F., Segonzac, C., Chang, K. N., Qiao, H., Ecker, J. R., Zipfel, C., & Rathjen, J. P. (2010). 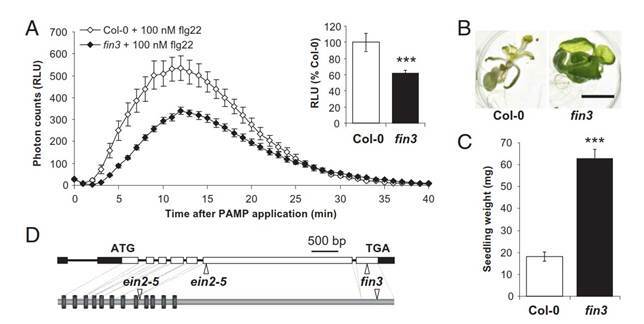 Direct transcriptional control of the Arabidopsis immune receptor FLS2 by the ethylene-dependent transcription factors EIN3 and EIL1. Proceedings of the National Academy of Sciences, 107(32), 14502-14507. 【3】Chen, H., Xue, L., Chintamanani, S., Germain, H., Lin, H., Cui, H., ... & Guo, H. (2009). ETHYLENE INSENSITIVE3 and ETHYLENE INSENSITIVE3-LIKE1 repress SALICYLIC ACID INDUCTION DEFICIENT2 expression to negatively regulate plant innate immunity in Arabidopsis. The Plant Cell, 21(8), 2527-2540. 【4】Shi, Y., Tian, S., Hou, L., Huang, X., Zhang, X., Guo, H., & Yang, S. (2012). 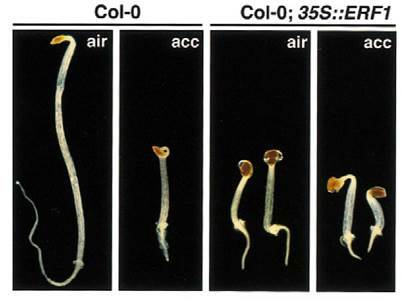 Ethylene signaling negatively regulates freezing tolerance by repressing expression of CBF and type-A ARR genes in Arabidopsis. The Plant Cell, tpc-112. 【5】Peng, J., Li, Z., Wen, X., Li, W., Shi, H., Yang, L., ... & Guo, H. (2014). Salt-induced stabilization of EIN3/EIL1 confers salinity tolerance by deterring ROS accumulation in Arabidopsis. PLoS genetics, 10(10), e1004664. 【6】Zhong, S., Zhao, M., Shi, T., et al., 2009. 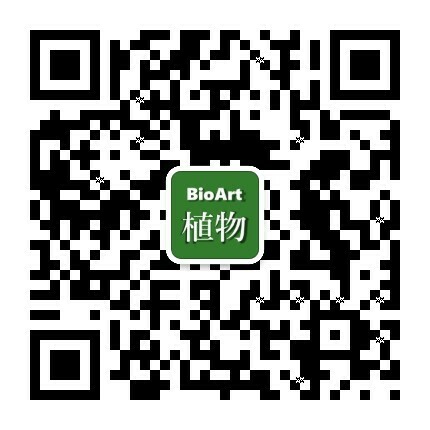 EIN3/EIL1 cooperate with PIF1 to prevent photo-ox-idation and to promote greening of Arabidopsis seedlings. Proc. Natl. Acad. Sci. U.S.A. 106, 21431–21436. 【7】Kim, H. J., Hong, S. H., Kim, Y. W., Lee, I. H., Jun, J. H., Phee, B. K., ... & Nam, H. G. (2014). 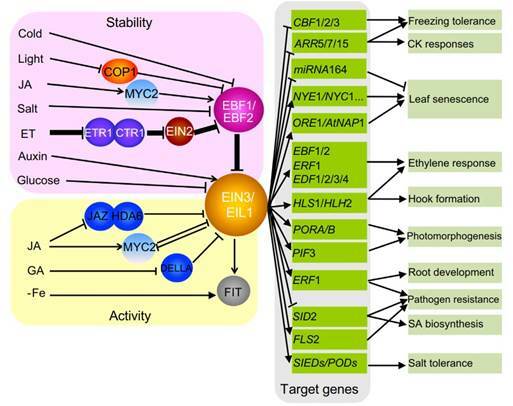 Gene regulatory cascade of senescence-associated NAC transcription factors activated by ETHYLENE-INSENSITIVE2-mediated leaf senescence signalling in Arabidopsis. Journal of experimental botany, 65(14), 4023-4036. 【8】Qiu, K., Li, Z., Yang, Z., Chen, J., Wu, S., Zhu, X., ... & Zhou, X. (2015). EIN3 and ORE1 accelerate degreening during ethylene-mediated leaf senescence by directly activating chlorophyll catabolic genes in Arabidopsis. PLoS genetics, 11(7), e1005399. 【9】Chang, K. N., Zhong, S., Weirauch, M. T., Hon, G., Pelizzola, M., Li, H., ... & Nery, J. R. (2013). Temporal transcriptional response to ethylene gas drives growth hormone cross-regulation in Arabidopsis. Elife, 2, e00675. 【10】Hao D, Sun X, Ma B, Zhang JS, Guo H (2017) Ethylene. In Hormone Metabolism and Signaling in Plants, pp203-241, edited by Li J, Li C and Smith MS.